Phencyclidine (PCP), a glutamate/N-methyl-d-aspartate (NMDA) receptor antagonist, has been shown to induce a range of symptoms similar to those of patients with schizophrenia, while d-amphetamine induces predominantly positive symptoms. Previous studies in our laboratory have shown that PCP can selectively impair the performance of an operant reversal-learning task in the rat. Furthermore, we found that the novel antipsychotic ziprasidone, but not the classical antipsychotic haloperidol, could prevent the PCP-induced deficit. The aim of the present study was to validate the model further using the atypical antipsychotic clozapine and then to investigate the effects of lamotrigine, a broad-spectrum anticonvulsant that is known to reduce glutamate release in vitro and is able to prevent ketamine-induced psychotic symptoms in healthy human volunteers. A further aim was to compare effects of PCP and d-amphetamine in the test and investigate the effects of the typical antipsychotic haloperidol against the latter. Female hooded-Lister rats were food deprived and trained to respond for food in a reversal-learning paradigm. PCP at 1.5 mg/kg and 2.0 mg/kg and d-amphetamine at 0.5 mg/kg significantly and selectively impaired performance in the reversal phase of the task. The cognitive deficit induced by 1.5 mg/kg PCP was attenuated by prior administration of lamotrigine (20 mg/kg and 30 mg/kg) or clozapine (5 mg/kg), but not haloperidol (0.05 mg/kg). In direct contrast, haloperidol (0.05 mg/kg), but not lamotrigine (25 mg/kg) or clozapine (5 mg/kg), prevented a similar cognitive impairment produced by d-amphetamine (0.5 mg/kg). Our findings provide further data to support the use of PCP-induced disruption of reversal learning in rodents to investigate novel antipsychotic drugs. 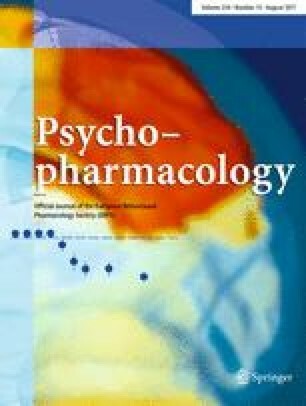 The results also provide evidence for different mechanisms of PCP and d-amphetamine-induced disruption of performance in the test, and their different sensitivities to typical and atypical antipsychotic drugs. The authors would like to thank Ben Grayson for technical assistance and Graham Pearson and Darren Brown for construction of the skinner boxes. Some of these results were presented to the British Pharmacological Society in January 2003.